Infinite Art Tournament: March Madness: Get Your Bracket Ready! 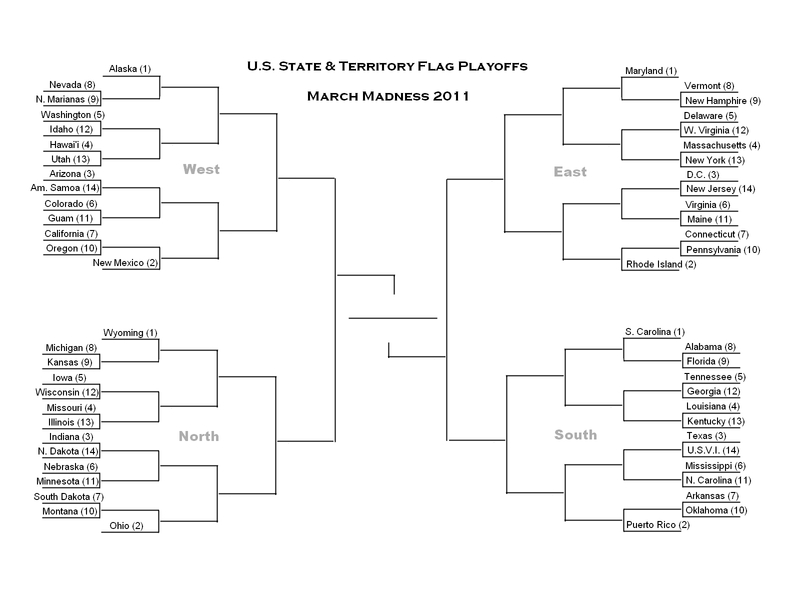 I can see why Alaska and New Mexico are the top seeds in the West bracket--they do indeed deserve a bye! Looking forward to the tournament! Alaska and New Mexico did really well in the regular season. Is there a way to print up this tree-grid thingie? I notice Oregon has TWO flags...hmm. Elaine: You could for instance right click on it, do a "Save Image," then either print it directly or insert it into a Word document and print it there. Sky's the limit, really. Oregon has one two-sided "flag." If you can call a two-sided object a "flag." I refer you to this post and the subsequent hijinx. Especially Rebel's contribution, which still makes me laugh every time I see it. I fear that one of my friends labeled me a 'Techno-Peasant.' Now you know why. Nice link--2008. Before My Time. 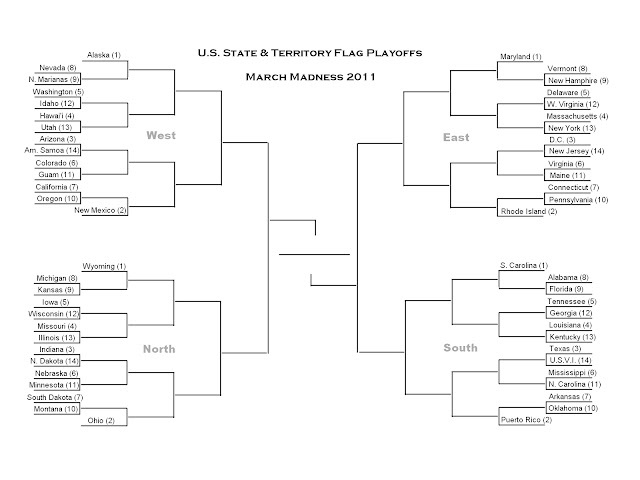 East: I pick VT; WV; MA; DC; VA; CT. Most of these are sucky and I expect them to get dropped. 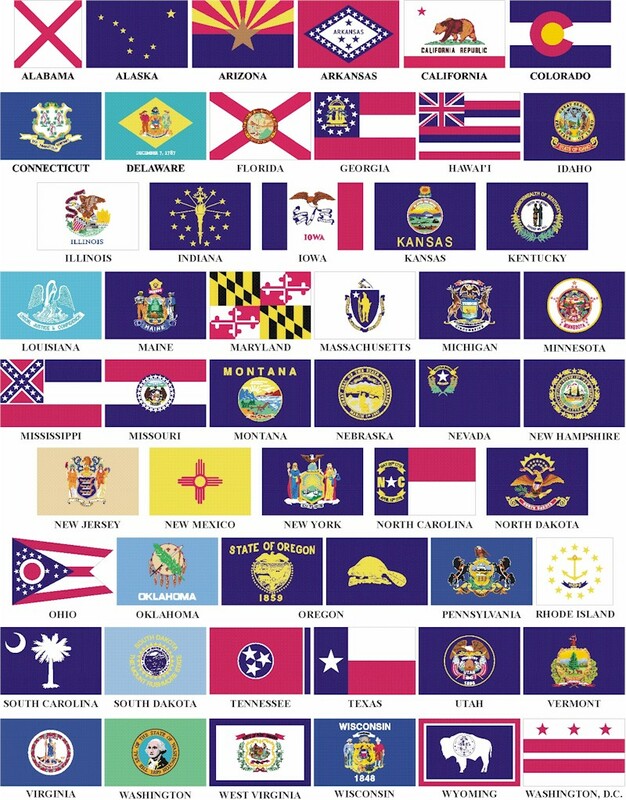 Aren't these flags all too "busy" to be considered? You have put the Virgin Islands and Puerto Rico at a disadvantage by not showing their flags - not that I was going to vote for them anyway. Regarding Ohio, sure, it's a second seed -- but it's in the Northern division, which in my humble opinion is pretty weak. Most of the real action will be in the West and South, I bet. Dug, true, I couldn't find a graphic that had all the flags just right. I'll have them both visible when they go head to head, though -- and at that point, you'll have the opportunity to point out that the images are of varying quality! Probably there will be a lot of bad calls.